Remember your childhood, where you were never tired of seeing your toy train on the tracks for hours altogether? To keep that constant for kids of all generations, Fisher-Price has come up with multiple toy train play stations that help kids to play for hours altogether without getting bored. Today we will talk about the various Thomas Train Sets with their features. Along with that, you would also know the benefits of these play stations towards a child’s learning. Are you thinking about how a simple play station can help a child to learn something? Yes, you read it right. The toy train play stations not only work as a great play sets for kids, these also help in the different areas of your child’s development with different skills. The first and the most important skill that your kid would learn from this play station is the motor skill. Fine motor skills like physical skills, cognitive skills will gradually develop within your little one automatically while they set up the toys. These skills would help him to be self-dependant on the other chores that he/she undertakes on a daily basis. By arranging the train and its tracks, your kid would develop the organizational skills within himself along with problem solving skills if there is any problem faced while setting things up. While arranging the tracks, kids might take a lot of time to arrange it successfully, but surely this initiative would be a life-long learning in terms of developing both their organizational as well as problem solving skills. Experimenting on something new is inborn for a child. While arranging the tracks and the trains, a child would also show his creativity. He would definitely try in various ways to set the play station successfully which in turn would encourage the level of creativity within themselves. While by now we know why toy train play sets are not merely play sets, however there is a lot to learn from it. Today we will discuss about five Thomas Toy Train Play Stations. The Island of Sodor Play Table is the ideal one for your kid to enjoy his play sets. This play station will help your kid to develop his physical, social as well as cognitive skills. This table is made with Thomas and Friends wooden playboard which features graphics of various locations from show that helps to increase the imagination and creativity power of your kids. The racks on the side of the play table are just appropriate to store the engines of the train. The table is made with solid wood which makes it more stronger than the other. 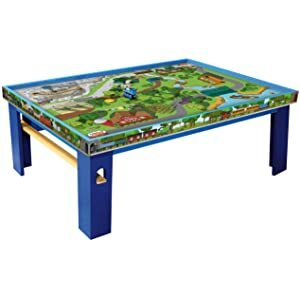 This table is compatible with all types of Thomas and Friends railway destinations, engines, accessories as well as play sets. This product is not too heavy to settle by your kids as it is of 2.2 pounds only. Also the assembling feature of this play set is very easy. Hence you can allow your kid to settle this on his own. An extra track is attached along with the table for child to understand and organize other tracks attaching one after the other. Fisher-price Thomas and Friends Super Station is another great play station for your kid. 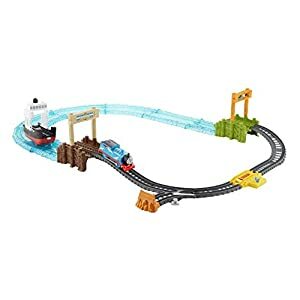 This play station includes Fisher-Price Thomas & Friends track master, Percy, Fisher-Price Thomas & Friends Adventure, Fisher-Price Thomas and Friends MINIS James and plastic Harold. This also comes with designs of different configurations that would fit in to any space in your room. If you are unable to accommodate the entire piece of the play station within the given space at your room, you can always choose to remove the legs of the play station. It can hold max 100 train compartments at a time. Both the height and the width of the set is easily accessible for the kids to play on their own.The set also offers a dual race track layout. Opening this track side-by-side creates super excitement within your kids. All you need to do is to choose the set of engines you want your kids to play with and just place them at the top of the play station. Except the My First Thomas Engines, all types of engines can go with this play station. Having multiple layouts made this play station is of 8 pounds. To fit this product in your room, you need space of almost 52x45x36 inches. This play station can be an ideal toy set from 3 years to 7 years as per the manufacturer. One can use it even without the battery. This set has come with the inspiration of Thomas and Friends movie, The Great Race. This set is purely assigned to give you the enjoyment of track racing. The entire set would be of approx. 3.5 pounds and can be a great entertaining item for your kids between 3 years to 6 years as per the manufacturer.The 6 feet long track lay out with two separate tracks brings the joy and excitement in your kid to see the direct competition between two trains. To start the race, first place the trains on track just behind the starting line facing them towards the bridge and then flip their switches to start the race. Once they start approaching towards the bridge, they follow their own tracks to reach to the destination. These separate tracks help both the trains individually to complete the full race. The set includes specially designed Percy Engines which features the design, inspired with great speed, on the side of the cab and an unique efficient racing Thomas, giving it the smartest looks ever. 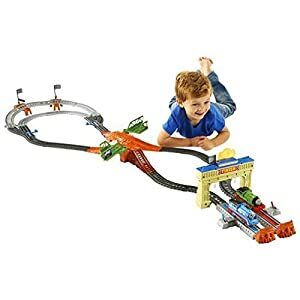 Thomas and Friends Fisher-Price Track Master will give you experience of such an motorized world which is connectable as well as expandable by its nature. This play station will not only help you with your kid’s physical development but also this will bring the cognitive development within your little one. Thomas and Friends Fish-Price Track Master is an inspiration from Thomas and Friends DVD Movie, Sodor’s Legend of the Lost Treasure. The play station includes the layout of full track, motorized Thomas with special seagrass decorations, rolling skiff, and treasure cargo. To start with, load the treasure cargo piece within the shed and it would slide down automatically into skiff’s hull. After that send the Thomas. As the Thomas passes, skiff slow down a different track and Thomas runs to catch him. The moment skiff reaches to the end point, it gets crashed in to the water of the play station. Thomas then gets stuck into the splattering waves while racing into the harbour. At that moment, allow your kid to release the stop-track by pressing the button so that Thomas can get free from this obstructions and continue his race as it is. 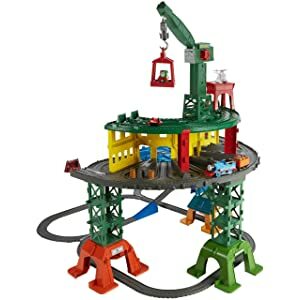 Like Thomas and Friends Fisher-Price Track Master, this play station would also help kids to enrich with an experience of such an motorized world which is connectable as well as expandable by its nature. And thus this play station would also take a participation in the development of their physical and cognitive skills very easily. The texture and color of the play set enhance the visual and tactile refreshment within the kids. You will be amazed to experience on the improvement of their eye-hand coordination while holding the running train and turning it on as per the direction. The 2 pounds of this play station will actually make your kid independent and enjoy the motorized world for hours. Boat and Sea Set is an unique concept launched by Fisher-Price based on sea-theme. 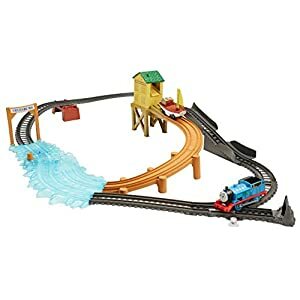 Fisher-Price Thomas and Friends Track Master, Boat and Sea Set consists of Thomas motorized train, a rolling boat, “water tracks” to be used by the boat, a standard Track Master train tracks and two docks. The rolling boat is powered to sail from one to dock to the other. Like the original ship, sails in the ocean, the rolling boat of this play set also runs on the to and fro concept. In this play station, kids will experience how the train, Thomas will move from its train track on the land to the floor of the ship and help the rolling boat to power to sail across the oceans to different global locations. Like many, this product is also easily assembled by your little one as it carries on 2.85 pound. Starting from the kids of 3 years till 7 years can spend their time setting up this play station and experience this journey by themselves. Hopefully by now you are sure about which is that one play station that you are going to buy for your little one.